MailCharts saves you the trouble of secretly subscribing to your competition’s emails and then spending hours trying to find something actionable. Below you’ll find the canonical reference for Mother’s Day email planning. From email examples to specific promotional strategies, we’ve included everything you need to ace your campaign. This email recognizes that even though you’re all grown up now, your Mom still treasures the gifts you made for her. We like that instead of just promoting its classes, Brit + Co’s email suggests crafting something together with Mom. That's a clever way to help customers create an unforgettable experience. 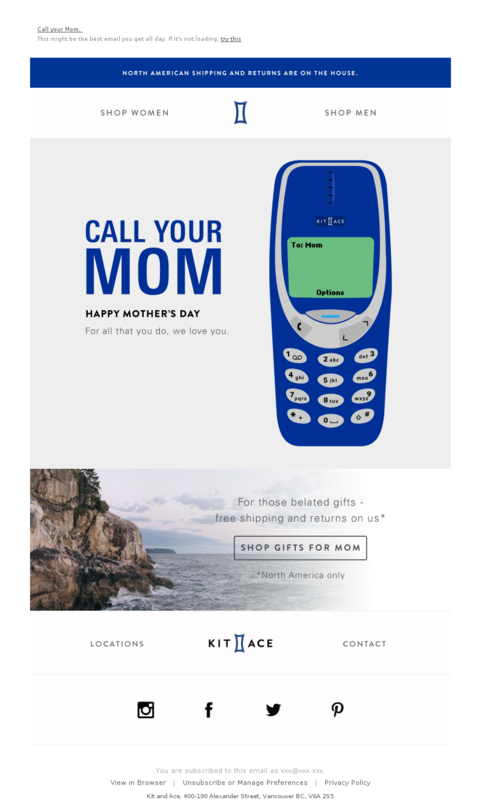 Hearts and flowers rules Mother's Day messaging, but this email takes a refreshingly less sentimental approach. It features a mom and son in a design as crisply tailored as one of RL's shirts. Consider this efficient approach if you want to make your Mother’s Day messaging stand out from the pink-drenched competition. We could watch the animations in this email all day long. The primary animation tells the story of a fierce female (Eleanor of Aquitaine) and should hold viewers' attention longer than the estimated 2-8 seconds it takes to read an email. The secondary animation showcases a rotating card collection. More to love: The gift guide uses personas to help uncertain shoppers zero in on the right category. Fierce! Instead of relying just on the usual appeal to Mom and Grandma, this email focuses on moms-to-be by targeting a stretch-mark remover for pregnant women and those who care about them. Even if maternity is not your product's focus, you might have products that would appeal to a lady-in-waiting. This might be our all-time favorite shopping reminder. The headline says “Call your Mom.” Who wouldn’t jump on that request? We love the animated text on the retro cellphone and the way the email frames the free shipping and free returns offer. It might be risky not to feature products in the email, but the goal — to prod procrastinators into action — doesn't get lost in the product shuffle. Here's another great campaign to get laggards to shop for Mom. 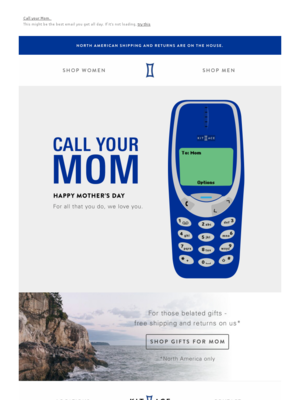 This email, sent 9 days before Mother's Day, frames its gift guide in relatable terms — not just things Mom might want but items that have a little backstory, such as the “Binge Watch Bundle.” A design element to scope out: the color-coded calls to action, which match the color theme of the product aligned with it. 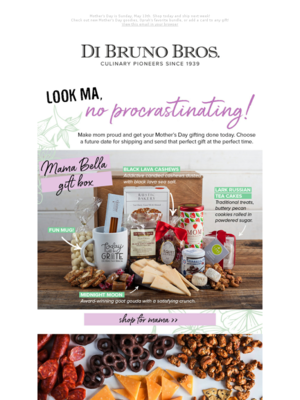 Start planning your Mother’s Day email strategy with great examples. Use the calendar below as a starting point to plan your email campaigns. This Bloomingdale's email calendar is based on Bloomingdale's, who sent 10 emails for Mother’s Day in 2018. This Pandora Jewelry email calendar is based on Pandora Jewelry USA, who sent 6 emails for Mother’s Day in 2018. Want to see a specific company’s email calendar? 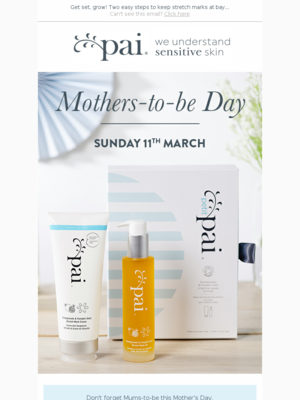 Will you simply send one email on Mother’s Day or will you send a few emails leading up to it, including a “last chance” email once the event is over? Based on 6588 emails mentioning "mother's day", "mom", "mother", "mommy" in the subject line. Discover the most popular types of promotions used for Mother’s Day. Note: One email might contain more than one type of promotion — this is why these totals may not add up to 100%. Understand how steep a discount companies offer for Mother’s Day. You can toggle between Dollars Off and Percent Off. perfect cadence and discount strategy. 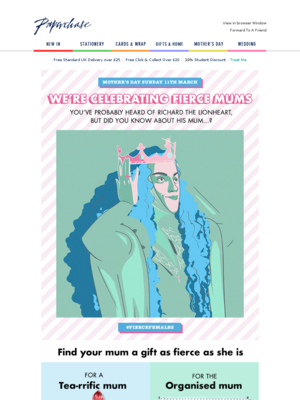 Ace your Mother’s Day email content with these ready-to-implement strategies. Enjoy! The United States and Canada celebrate Mother’s Day on the second Sunday of the month. In the UK, Mother’s Day was originally a religious holiday called Mothering Sunday and is the fourth Sunday of Lent, three weeks before Easter Sunday. Here are a few strategies to help you with your campaign planning. 1. Forget the discount. Go for exclusivity! 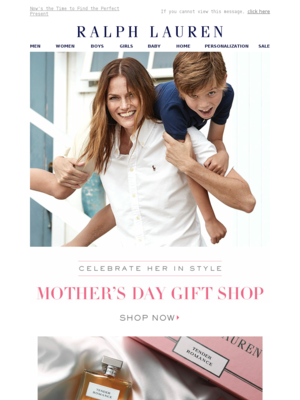 On this holiday, exclusivity reigns over “SAVE 50%.” You’ll see plenty of discounting in the week leading up to Mother’s Day, but if you launch your campaign two to three weeks before the holiday, you’ll have the inbox almost to yourself. This early-bird approach gives you time to promote pleasure-giving over penny-pinching and engage your subscribers with creative, memorable messages. Once again, we’re talking about Mom here. Even for heavy discounters, elegant design (attractive copy and typography with appealing imagery) wins over hard-sell, discount-driven, and anxiety-inducing last-minute messages. Statistic Brain found 36.5% of moms wanted “something handmade” for Mother’s Day. If that’s not your market niche, do the next-best thing: Show your shoppers how to create an experience for Mom using your products or services. A UK marketing agency found Mother’s Day messages with emotional content (copy and images) converted better than product or incentive-driven emails. 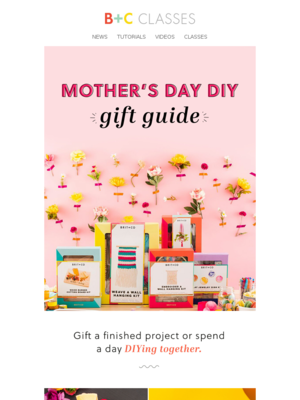 If you have the time, test two versions of a Mother’s Day email – one that piles on the hearts and flowers and a more straightforward product message.